My general methodology goes like this: restaurants must be located within half a mile (about a 10-minute walk) from the stations, they must receive at least four stars from Yelp reviewers and there has to be a minimum of 10 Yelp reviews in order to make the cut. If some restaurants listed don’t match this criteria, I’ll make note of it. First up, the Little Tokyo/Arts District Station. The first stop headed east from Union Station is packed with places to eat. Metro’s map listed three places, my Yelp search returned 193 restaurants! Wow. Let’s see what stands out. 4.5 stars based on 536 reviews. 4.5 stars based on 277 reviews. Another well received sushi bar. 4 stars based on 153 reviews. Delicious Japanese desserts. I’ve been here, the mochi is awesome. 4.5 stars based on 24 reviews. Korean BBQ in Little Tokyo. 4 stars based on 299 reviews. 4 stars based on 1096 reviews. 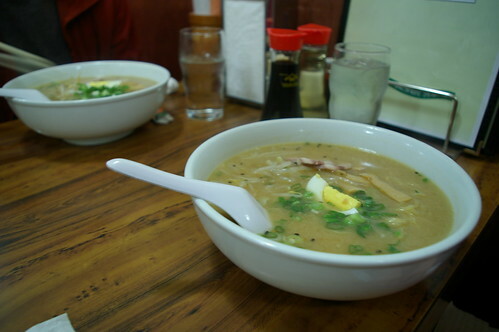 The most popular ramen restaurant in Little Tokyo. 4 stars based on 19 reviews. Japanese izakaya (drinking establishment with food on the side, sort of the Japanese version of the gastropub) with an extensive menu. People seem to rave about the chicken wings. 4 stars based on 111 reviews. Bakery serving unique Japanese desserts and baked goods. 4 stars based on 24 reviews. The name says it all: sushi! 4 stars based on 23 reviews. Quaint restaurant serving Japanese staples. 4 stars based on 43 reviews. 4 stars based on 180 reviews. Japanese food, open until 3 a.m. on weekends. Party, eat at Suehiro, catch the first train back to East L.A. around 3:40 a.m.
4 stars based on 205 reviews. 4 stars based on 70 reviews. 4 stars based on 28 reviews. Another sushi favorite in Little Tokyo. 4 stars based on 150 reviews. Japanese restaurant specializing in rice bowls. 4 stars based on 135 reviews. 4 stars based on 108 reviews. 4 stars based on 671 reviews. Sausages, fries and beers in an über hip setting. One of my favorites. 4 stars based on 198 reviews. More sushi. I wonder if the Gold Line is the most sushi accessible light rail in the country? 4 stars based on 202 reviews. More sushi, but this time in the Arts District instead of Little Tokyo. 4 stars based on 56 reviews. Japanese restaurant located in the Kyoto Grand Hotel featuring a tempura bar. 4 stars based on 195 reviews. Another izakaya, open till 1:00 a.m.
4 stars based on 174 reviews. Burgers and wine in the Arts District. 4 stars based on 221 reviews. Delicious Japanese curry dishes. One of my favorite spots in Little Tokyo! 4 stars based on 18 reviews. Insanely tasty chicken at an affordable price. I’m addicted to this stuff. 4 stars based on 54 reviews. Ramen house hidden in the Little Tokyo Shopping Center. Thirty-one four-star restaurants and we’re only on the first stop of the train line. In the next posting I’ll be looking at the restaurants across the river near the Pico/Aliso Station.